It wouldn’t be a true Jess Sultaire day at Women and Infants hospital if I didn’t cause a little bit of trouble. 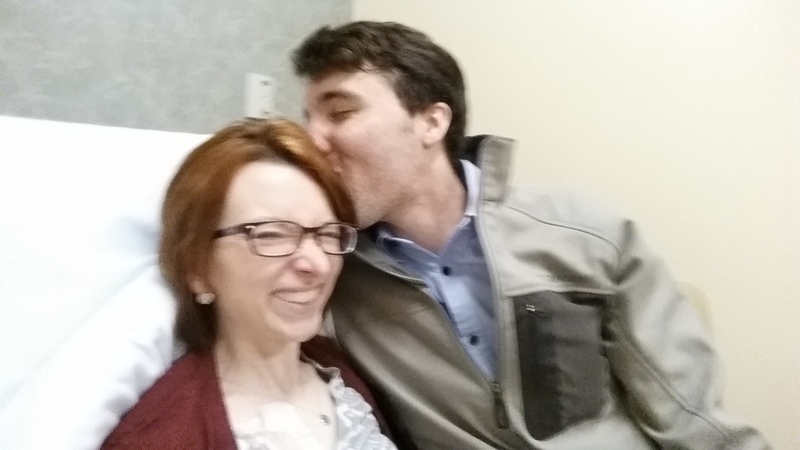 Today began as your average weekly chemo day would. Day 1 of another 3 week cycle: steroid, Pepcid, Benadryl, 1 hour of Taxol, and 3 hours of Carboplatin. A little background surrounding Carbo. There is a risk of allergic reaction therefore you are required to take 20 mg of steroids the night before and the morning of chemo on the Carbo days. I was pretty confident that I wouldn’t have a reaction. I still took the steroids as a precaution but mostly because I’m a rule follower. Even so, I was confident that if I was going to react to Carbo, it would have happened already. Fast forward to the beginning of hour 3 of 3 for Carboplatin. With growing concern in her voice she called in the first infusion nurse she could find. It turns out it was a potentially far more serious situation than I knew. All of the sudden EVERY chemo nurse had surrounded my bed. I’m not joking- there were 8 medical professionals crammed into this room. Everything happened so fast. I was having a reaction to the Carbo and the protocol is to act quickly. They swiftly hooked me up to the blood pressure cuff and pulse oximeter to continually monitor my blood pressure, pulse, and blood oxygen. I they pushed a dose of steroid and Benadryl directly into tubing to reverse the effects of the reaction. Even though I was physically okay. Something happened, in my mind I was triggered. The sudden rush of nurses and their collective looks of concerns tapped into a buried trauma. It was so reminiscent of the fear and confusion I felt when I went into septic shock earlier this past summer. I didn’t have a visual “flashback” but I very intensely tapped into that deep seeded fear and confusion where I didn’t know what this all meant. I began to experience an involuntary physical reaction to that fear- increased heart rate, shortness of breath, tears.I can’t be sure because I don’t believe I have had one before, but I think this could be classified as an anxiety attack. They placed oxygen under my nose to help me catch my breath while Betsy and Caryn rubbed my back and reassured me that I was okay. I know I speak incessantly about the stellar care I receive at Women and Infants but it cannot go unacknowledged just how well they support their patients. In addition to every single nurse coming to my aid and knowing just what to do, they were incredibly warm and compassionate. One of them even ran upstairs to get Sheila because she knew we were close and thought she would help to make me feel comfortable. If this blog ever ends up in the hands Mark Marcantano (President and COO of WIH), the following infusion staff deserve a massive raise and recognition as a result of this particular incident: Amparo, Betsy, Caryn, Ann-Marie, Ivone, Beth, Susan, Sandra, and of course Sheila. Over time the redness came down, I was able to catch my breath, and the fear subsided. Betsy told me that she would stay as late as it took for the redness to disappear. By about 6pm I was back to normal. So after all of the months that I’ve receive platinum based chemotherapy dating back to 2013, why now? Why would I react all of the sudden? While I had assumed (wrongly) that the more exposure to something, the more your body gets used to it, that is not true in this case. Over time your body can start to view the Carboplatin drug as an antigen, meaning a toxin/foreign substance/allergen. As a result, your immune system reacts by sending antibodies to fight against the antigens. The next two weeks of my chemo cycle is fortunately only Taxol. When my new cycle begins we will likely do a “desensitization chemo”. This protocol is considered when a drug is seemingly working but a patient reacts like I did to it. Instead of going to the infusion center I would receive the treatment in the main hospital oncology floor. I wouldn’t be inpatient (I can go home when it’s done), but the infusion would be incredibly slow. It’ll be a pretty long day but it’s a safer way to infuse and reap the benefit of a drug that could be working under close supervision. Now, if this desensitization chemo still causes me to react, we will probably have to break up with Carbo. We could potentially just continue with Taxol only or maybe Dr. Robison will have another chemo up her sleeve to try. So that’s that. I’m totally fine. Aside from feeling fatigued, I’m feeling okay today. I will need to have Cory bring me to Providence to pick up my car from the hospital. I ended up needing so much Benedryl yesterday that they told me I couldn’t operate heavy machinery for 24 hours. Sarah Breen is an incredibly selfless human and no questions asked picked me up from chemo and drove me the 45 minutes home even though she worked all day (an hour away as it is). THANK you Sarah. I love you more than you will ever know for all you do and all you are. Holy moly I am feeling the love! Usually I end my entries with the appreciation I have for those cheering me on. I still receive daily messages from family, friends and supporters from all over the globe. It is that encouragement that helps me to continue this fight. Thank you for your unconditional kindness. The love fest continued yesterday at the Women and Infants infusion center. It was like coming home. The documentary was essentially a result of Netflix Roulette. A little offbeat but worth a watch if you want to see the impact of becoming a viral internet sensation. As you can see the evening before new chemo wasn’t tense or worrisome. We just went about out night, a rare midweek dinner date at home, and I adored it. The next morning while I pulled myself together (put on sweatpants) Cory made breakfast because he’s a stud. After breakfast we packed up my infusion supplies (phone chargers, a cozy blanket, books, etc.) and made the 1.9 mile journey to W&I. ONE POINT NINE MILES. Beats the hell out of the 2 hour commute to and from Boston. My former chemo nurse Sheila is now my nurse navigator and straight hooked me up at the infusion center. She got me a room with a BED! I only had that once in my previous IV infusion experience. It is a rare treat, especially when you’re receiving Benadryl pre-drugs (right Jen?). My new chemo nurse was at a conference so Sheila set me up with “boss lady” Heather (Sheila’s words, not mine). “Boss lady” has been in women’s oncology for over 17 years and she was amazing! When she accessed my port I barely felt it and her bedside manner was unparalleled. She had a sunny disposition and made sure that Cory and I were comfortable. I am a major fan of her. I’m also a fan of the fact that her and Sheila are working on assigning Rosa as my regular chemo nurse. Rosa treated me previously as well as my friend Jen. I adore her and I’m happy to be seeing her again. I’ve talked about this a lot in my blog before but I have to stress what a strong sense of community WIH has. Everyone remembers you from the front desk to the phlebotomist to the nutritionist to nurses you didn’t even have! All of the aforementioned people popped in my room to say hello. They weren’t pleased that I had to come back but I did feel the warm welcome. I think that it gave Cory some peace of mind to see me surrounded by such loving and positive people. I’m painting a rosey picture here but the reality is that no one looks forward to chemo infusions. What I can speak honestly about is that I look forward to the warmth felt in this particular infusion center. It turns a crappy situation into an experience not quite as bad. Even though Sheila works in the main building now, she stopped by in the afternoon to say hello. I was deep into my Benadryl nap and I felt someone jump on top of me. In true Sheila fashion she climbed into bed to give me a big hug and say hello. This would only be weird if it wasn’t her. Overall the infusion went well. We were only there for about 4 hours (in comparison to my previous 8-10 hour stints). I was also told that I will be there for even less time in future infusions, maybe 2 hours max? Honestly, once the Benadryl hit my veins it was all over. I fell fast asleep and only woke up periodically when the IV pump beeped to switch over to the next drug. Poor Cory sat in the dark room for hours answering work emails while I passed out. When it was all over I was famished and had an undeniable craving for Harry’s Burger bar. So Harry’s it was! I housed two sliders and some fries then immediately went home and took another 4 hour nap. I woke up around 8pm to my darling washing dishes and tidying up the kitchen. Seriously where did I find this man?! (Thank you for being born Sam Favata, without last year’s birthday celebration I would be Cory-less). Cory made me a cup of tea and we cozied up on the couch and watched hours of Top Gear. Another perfect evening at home. Aside from feeling tired I generally felt well after the infusion. It wasn’t until almost midnight when I went to lay down and was overcome with nausea. Unfortunately I threw up. I don’t believe it was a result of the chemo though, it was probably gorging myself with burgers and fries then topping that off with some Ensure plus. Too much for my little tum tum. 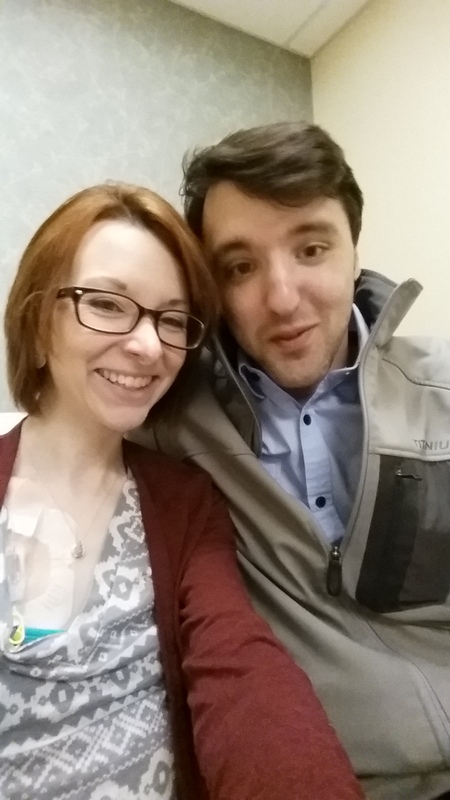 Today I feel perfectly normal so I’ll say that new chemo thus far is a success! Let’s hope that it’s killing tumors so I can really call it a success in a few months. Next week I will be joined by my lovely parents so they can see first hand how well I’m being cared for 🙂 In the meantime I return to normal life. Today I’m popping by the Izzy Room at Hasbro Children’s Hospital to see my dear friend Sarah pull off the greatest disney party of all time for the little patients and their families. Tomorrow I have the honor and pleasure of attending my cousin’s bridal shower and visiting with family in Connecticut. Monday- back to work. I want to thank everyone again from the bottom of my heart for the love and support. Every drop of it is internalized and greatly needed.